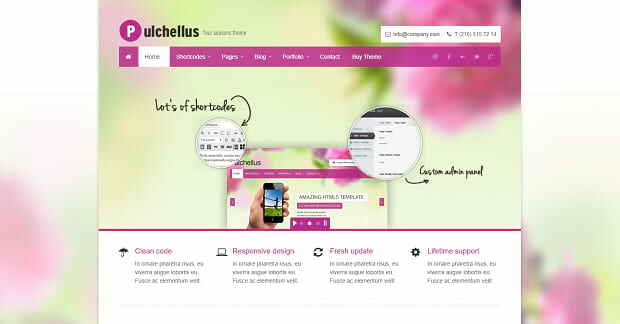 Looking for spring WordPress themes to brighten up your website? Spring is in the air, and that means it’s time to welcome visitors to your site with a bright, colorful theme. Why choose a lively spring theme? Bright colors are friendly and inspiring to your visitors. Beautiful nature photography and icons can perfectly match your brand. Floral patterns are welcoming and elegant. If you’re reworking your website, what better theme than one that represents renewal? Business or blog, bright colors, patterns, and nature imagery can be a great choice for your website. 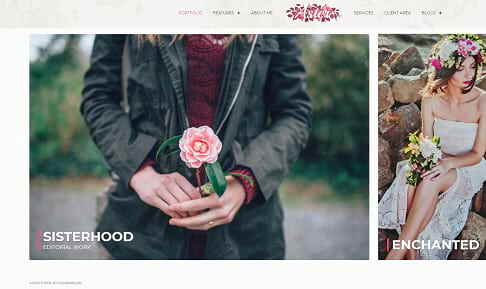 Let’s take a look at some of the brightest and most beautiful spring WordPress themes! Why have just a spring them when you can have all four seasons? If you plan on changing your theme to match the time of year, Pulchellus is the theme to go with. Switch between layouts any time, and use the helpful shortcodes to customize your site! 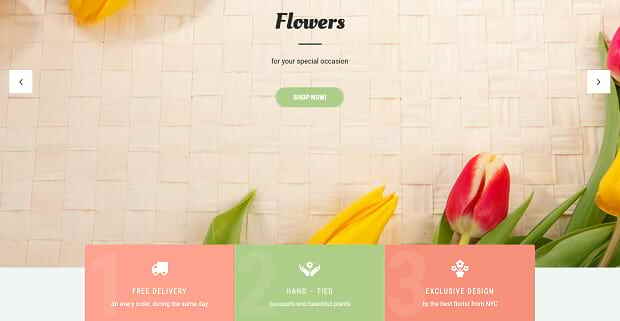 Florists will adore this colorful WooCommerce-compatible theme. There’s room for everything: company intro, store gallery, testimonials, news, calls to action, and more! There’s quite a few variations, like changing the header/footer or adding a sidebar, so poke around and see if you can customize Flower Shop to your liking. This one-page theme was made for businesses, and it comes with all sorts of unique design features. Dynamic page design means your visitors won’t get bored, and the page is filled with fun animations. There’s also a light and dark theme included. Rosebud is a stunning theme package that comes with three layout options: overall presence, business-focused, and showcase-focused. No matter how you want to show off your flower arrangements, bouquets, and floral products, there’s a template for you. These three stunning theme layouts are a perfect fit for nature-focused companies. There’s a pretty default theme, a charming one-page version, and a more simplistic and practical boxed version. Whatever you choose, you get a great theme for your ecology website. 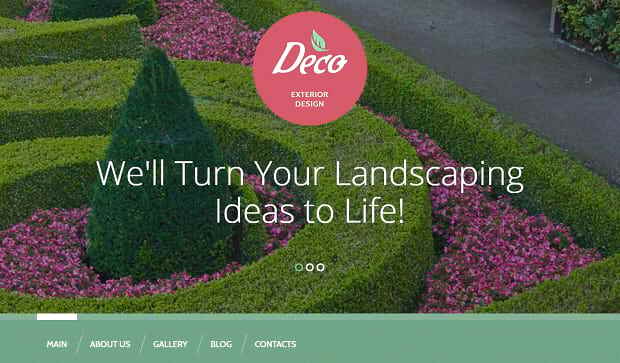 For landscapers and exterior designers, or anyone who needs a clean, spring-like presentation for your business, you’ll like this theme. It’s fully editable and comes with plenty of customization elements. Aster was built for ease of use, and it’s perfect for photographers searching for a portfolio theme that’s just right. Simplistic elegance dominates this photography-focused design, and the beautiful side-scrolling homepage portfolio will instantly get potential clients’ attention. And don’t forget the client area where you can upload completed shoots and even password protect certain galleries! 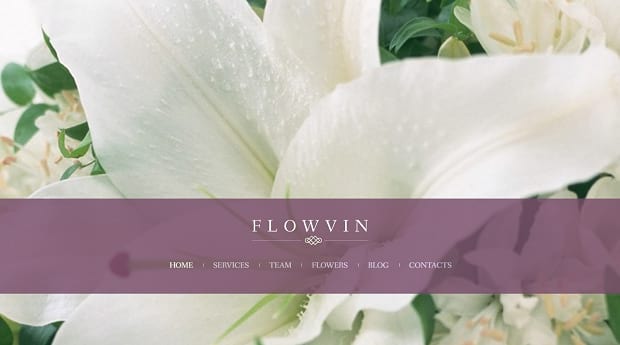 Romantically designed, FlowVin is a gorgeous one-page theme for florists, fashion designers, and any business looking to add an elegant touch to their website’s branding. For online stores, there is a separate shop page, and a blog too. This nature-inspired theme uses bright green and grey to create a dark, comfortable look. The spacy, flat design and huge slider make it a great theme for showing off photography, or a good, simple theme for any business. Tired of green and pink in your spring themes? Try purple! Of course, with the extensive customization tools and modules, you can customize this theme as much as you want. Great for event planners and any type of business. Nothing is better for sprucing up a website than a beautiful spring theme. Some are elegant, some are lively; some are simple and some are bright and colorful. But all of them are perfect for those who are looking for a fresh new look for their site. Let us know which theme you picked, and check out our other article on 9 Adventurous WordPress Themes for something a little more exciting! If you found a theme you loved, please follow us on Facebook and Twitter for more!